Today's pre-conference options include a morning invasive weed walk starting at 7:30 a.m., a full day workshop on creating a naturalist's sketchbook, an afternoon kayak tour of the Susquehanna River, and an afternoon workshop on perennial plant propagation from sourcing to market. Decisions, decisions . . . Oh wait. 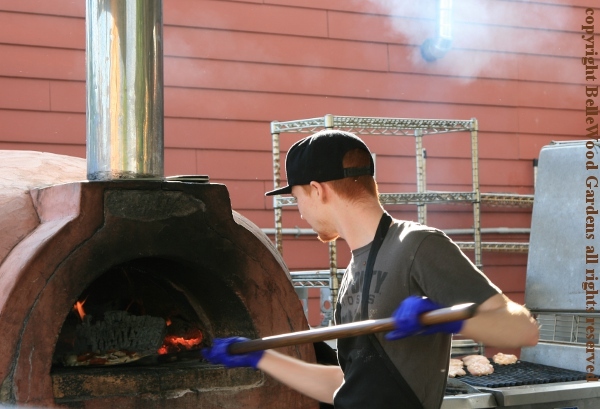 There's also an off-site dinner trip to a Wrightstown restaurant. 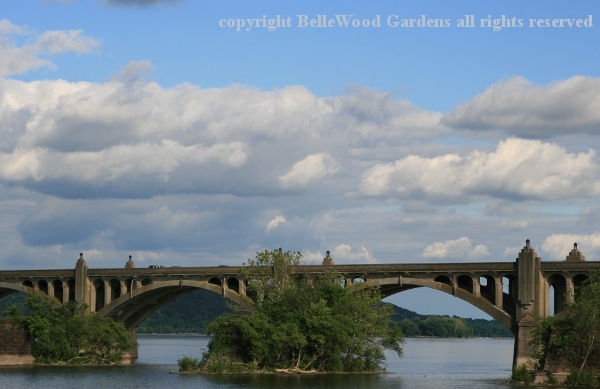 From BelleWood Gardens in New Jersey to Millersville University in Pennsylvania is 130 miles. I decided to schedule things so I would leave home early in the afternoon. The idea was to register, get dormitory room key and unload luggage. And join the 40 or so people taking the yellow school bus to have a delightful, delicious dinner at the John Wright restaurant on the Susquehanna River. The restaurant's back lawn slopes down to the river with a wonderful view of the Columbia Wrightsville bridge, which opened on September 30, 1930. 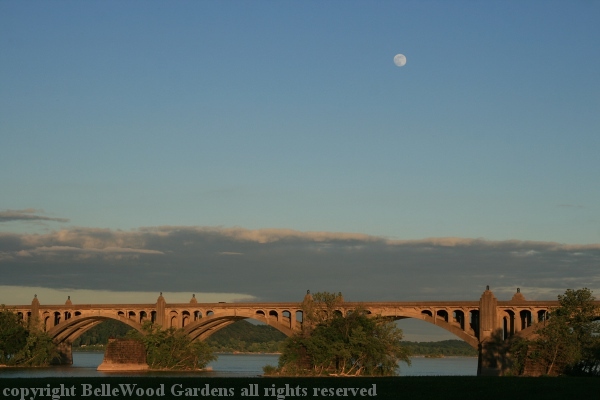 At 5,183 feet long, it is the world's longest concrete multiple arch bridge. 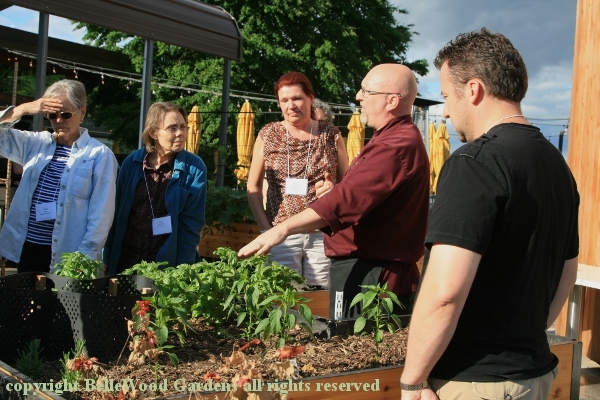 Taking half of our party at a time, chef Jim Switzenberg takes us around the small raised garden beds. Everything is done organic, compost is made from any vegetable waste that doesn't go to the three farms raising pigs to become pork for the restaurant. As you can see here, Chef Jim is very particular about what the kitchen serves, down to specifying not merely the cuts of beef used for their hamburgers, but each burger is made from beef from a single cow. With limited space he can only raise a few tomato plants, cucumbers, and such. The herbs though, are superb and ample. 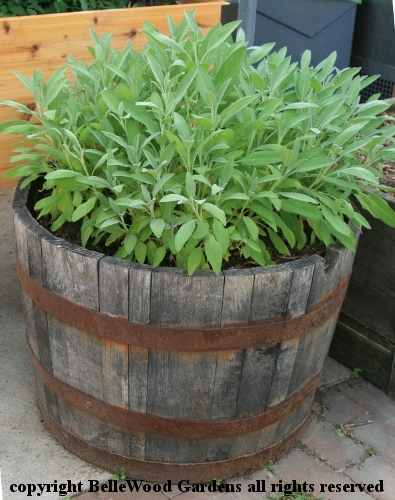 Basil, dill, parsley, tarragon, thyme, and a marvelous half barrel of sage. Several years old, it is maintained by cutting back hard. Underneath this lush, fragrant growth, he assures us, it is quite woody. 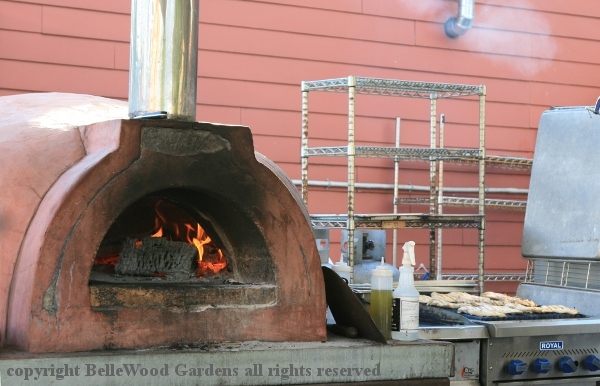 As we turn to go back indoors I notice this wood fired pizza oven. And a pizza going into the oven. We are seated at four long tables, set at an angle to the room. Included with the registration fee for our meal are two drinks apiece: choice of several local micro-brew beers on draft, wine from Allegro Winery, ginger mead, even locally made whiskey. Food is served en famille, and we pass the platters among ourselves at each end of the table. Caprese salad of mixed greens, local cherry tomatoes, fresh house made mozzarella and a balsamic vinaigrette, with pita chips. Mediterranean salad of mixed greens, red onion, kalamata olives, tomato, cucumber, local raw feta, house dressing and pita chips. Baked Maryland crab dip. Blue catfish nuggets with Cajun aioli and corn relish. Pork belly Korean BBQ with kimchi salsa. 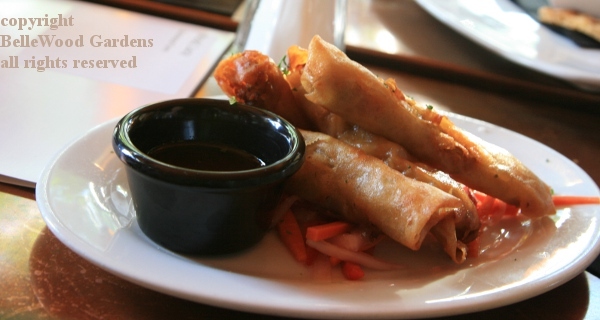 Local pork spring rolls with sweet chili sauce. 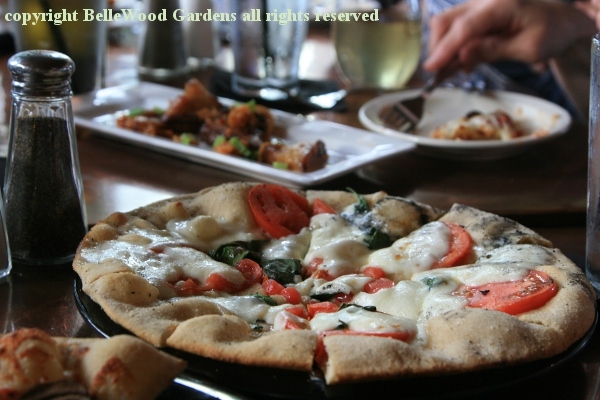 margherita pizza with tomato, basil, and their fresh mozzarella. Then there's desserts to be shared around. Now, I know dessert is spelled with two "S" so you can ask for seconds. But we were given four: a fat domed peanut butter bombe robed with chocolate, raspberry cheesecake, bacon ice cream, and creme brulee. We're at the western side of the time zone, so sunset is later than I am accustomed to. This was a very pleasant, leisurely start to the conference. Now we get back on our yellow school bus. Back at Millersville University, back to my dorm room, it's time to sleep. Tomorrow will start early. The plant sale and trade show opens. A day with full audience and concurrent sessions. Picnic dinner and outdoor games, then evening entertainment and social. But now it is time to sleep.